Comprehensive review of Vita Liberata Trystal Minerals Self Tanning Bronzing Minerals. See what real experts and actual users have to say about this self tanning product. After trying Vita Liberata Trystal Minerals, I gave it 1.5 out of 5 stars because I didn’t like it. The concept of this product is very interesting; it’s a loose bronzing powder with DHA in it. But after trying it, I got no self tanning effect whatsoever. I also read online that this was a common complaint among its users. The bronzer itself is just ok. They only have two shades to choose from, and it’s kinda hard to blend in. I also looked ridiculous wearing it because the bronzer made my face look tan, but my body was so pale. When I washed my makeup off, the bronzing effect went away completely, and I was left with no tan. The cost per ounce of this bronzer is $171.88 per ounce, which is SO ridiculous for a self tanner. I used to really love the Untinted Body Gel from Vita Liberata, but they discontinued that product, and ever since I haven’t been impressed with any of their products. I keep wanting to like them so bad, but they’re honestly not very good. The nice thing is it has no smell, and there’s no drying time. But those are moot points, if you don’t get a tan. So I really didn’t like this product, hence the 1.5 star rating. This product is very different than most self tanners on the market. It comes in the form of a loose bronzing powder. The bronzing powder is dark brown in color, and doesn’t have any shimmer to it. You’ll need a makeup brush to apply this one, no tanning mitt required. Online it says it comes with a Kabuki brush to apply, but I never received this. I dumped a little bit of product into the cap, and then dusted my brush in it. I then applied the bronzing powder on top of my liquid foundation just like I would my normal bronzer. This bronzer doesn’t blend in too easily, so you’ll really need to work the brush to get the product to blend into your skin. Even when I was done blending, this bronzer looked a little dirty on my skin tone. Overall, application took about 3 minutes, and it’s nice that you don’t need to wear a mitt or worry about staining anything. Since this self tanner comes in the form of a bronzing powder, there’s zero drying time…which is great! There’s no self tanner smell with this one; it smells like any bronzing/makeup powder does (virtually scent-free). As the day wore on, I never smelled any DHA (self tanner smell) which is always a plus in my book! So, as far as the self tanning results go, I didn’t notice any change at all. I see a lot of people complaining about this online too. So I don’t think DHA works as well in powder form, but that’s just my guess. But I literally saw zero self tanning results. As a bronzer, this one is just ok. The bronzer is a nice color, but on me it looked dirty and was too dark for my skin tone when I wasn’t tanned. Which leads me to my next point, people using this product are pale, wanting to get a tan. When I applied this product, my face became a totally different shade than my body. So I had a tan face, but pale body. It looked really weird, and like I didn’t know how to apply my makeup! Also, there’s only two shades available in this bronzer, and I know that two shades won’t cover every skin tone. 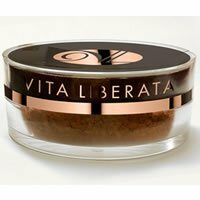 Vita Liberata always comes out with these interesting products, but none of them seem to work. I think they should stick with making regular self tanners. Well, this one only lasts until you wash it off. There was no lasting self tanning effect. No, men don’t usually wear bronzer, and I don’t think it works as a self tanner. To buy Vita Liberata Trystal Minerals, Click Here. Look and Feel This is a brown, loose bronzing powder. Application Applying is ok, but the bronzer is hard to blend in. Drying Time There’s no drying time. Smell (Before) It doesn’t smell like anything. Color Produced I had no lasting tan, and the bronzer was just ok.
How Long It Lasts The bronzer only lasts until you wash it off. Price It’s only $171.88 per ounce, yes you read that right.